In 1954, the magnificently preserved timbers of a 43.m (143.97′) funerary vessel were discovered dismantled and neatly stacked in a sealed limestone pit carved from the bedrock beside the Great Pyramid at Giza, Egypt. Dated by cartouche to the Fourth Dynasty reigns of Khufu (Cheops) and his son Djedefre some 4,500 years ago, most of the important maritime archaeological details of this historic discovery, its restoration and reconstruction remained unknown and/or unpublished until a 1982-1983 “rescue” season. 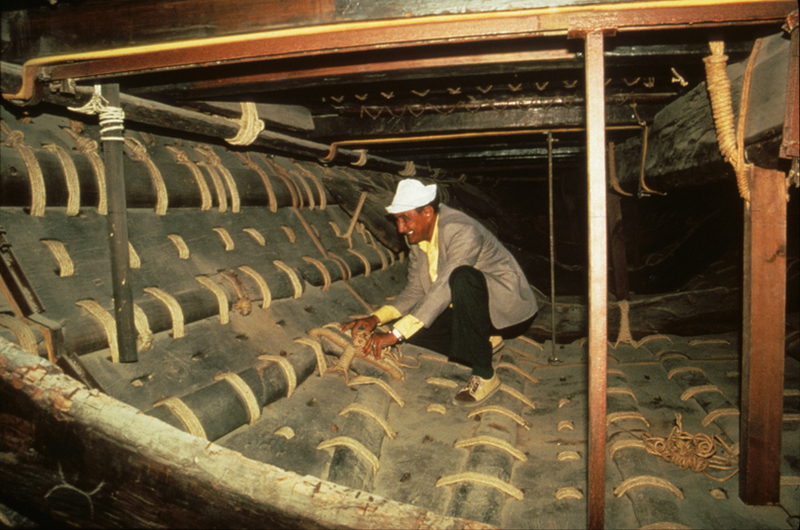 In 1981 while visiting Giza, Egypt, Paul Lipke had a chance meeting with Hag Ahmed Youssef Moustafa, retired Chief of Restoration and the Khufu Ship’s restorer for the Egyptian Antiquities Service (EAS). Between February 1 and April 30, 1983, Hag Ahmed Moustafa and Paul Lipke worked together closely to achieve four goals. These were: update, expand upon, clarify and/or correct earlier publications on the Fourth Dynasty vessel; document (for the first time) the restoration and reconstruction of the ship in order to help the EAS plan and execute its long term conservation; document what records existed, and by implication what remained to be researched from the ship itself; increase the knowledge and understanding of this unique ship among professionals in Egypt and elsewhere. The rescued material was published in “The Royal Ship of Cheops,” Lipke, BAR International Series 225, 1984. 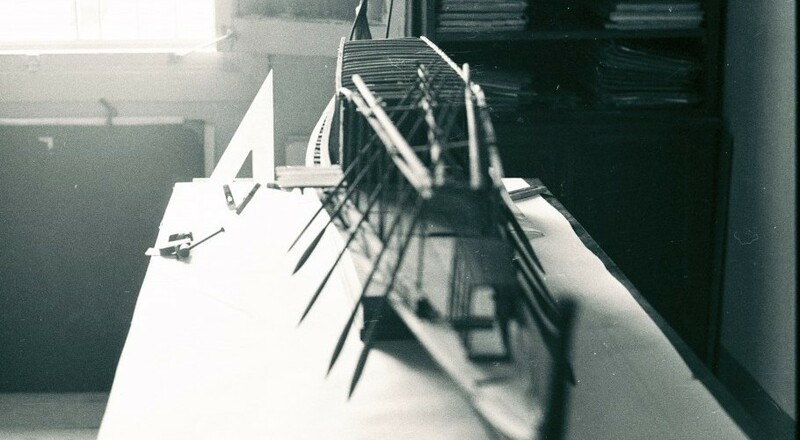 There is strong evidence the ship’s construction technique was designed to facilitate dismantling, so ships could be more easily transported–in pieces–across the desert or around the Nile cataracts. The deckhouse is assembled of prefabricated sections and attached to the hull in a manner apparently designed to ease re-arrangement of the structure to accommodate a variety of cargoes. Planks as much as 21 m (72 ft) long are locked end to end with complex, hooked scarfs. Plank alignment is maintained by mortise and tenon joints, which later became the standard method for fastening planking throughout the Mediterranean and much of the world for thousands of years, until about AD 1,000. ABOVE: A view of the lashing (Photo: Sheri Moore).